Database systems are made-up of complex data structures. To ease the user interaction with database, the developers hide internal irrelevant details from users. This process of hiding irrelevant details from user is called data abstraction. Physical level: This is the lowest level of data abstraction. It describes how data is actually stored in database. 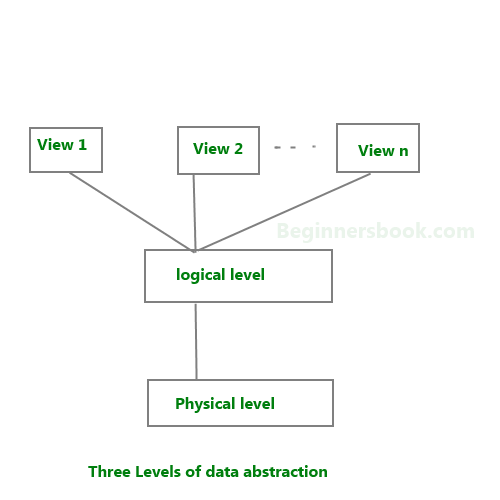 You can get the complex data structure details at this level. Logical level: This is the middle level of 3-level data abstraction architecture. It describes what data is stored in database. View level: Highest level of data abstraction. This level describes the user interaction with database system. Example: Let’s say we are storing customer information in a customer table. At physical level these records can be described as blocks of storage (bytes, gigabytes, terabytes etc.) in memory. These details are often hidden from the programmers. preparing for exams and limited time only….! Amazing! nicely explained the topics. Wonderful Explanation. Helps to understand the levels of database and data abstraction in one shot.